My helpful Commonwealth Delegate Tom Rust, who is currently running unopposed, conveyed a bit of information which I certainly found interesting and I hope you will too. The Secretary of Transportation and the Commonwealth Transportation Board will conduct nine public meetings across the state in October and November. These meetings are being held to give stakeholders the opportunity to review and provide comments on projects and programs to be included in the Fiscal Year 2013-2018 Six-Year Improvement Program. This includes highway, rail, and public transportation initiatives. Following the open house from 6:00-6:30 pm, there will be and opportunity for the public and transportation stakeholders to comment. Written comments may also be submitted during this informal session, or they may be mailed or e-mailed until December 12, 2011. The Northern Virginia meeting will take place on Tuesday, October 25 beginning at 6:00 pm at the VDOT office, 4975 Alliance Drive in Fairfax. I plan on attending this meeting to speak about an issue very important to me at the Commonwealth level: Electric Vehicle access to High-Occupancy Vehicle lanes with single occupancy. In Virginia, we've had 3 different phases of the HOV easement for clean fuel vehicles. It all started with House Bill 1881 and Senate Bill 771 of the 1993 session of the General Assembly, which established the Clean Fuel license plate and is the origin of the Virginia Code § 46.2-749.3. Special license plates for clean special fuel vehicles. (Unfortunately, the on-line legislative records don't go back as far as 1993 so I can't provide an exact link to the text of these bills.) Then in the 1994 session, Senate Bill 71 added an easement to allow Clean Fuel vehicles to use the HOV lanes as single occupancy as per Virginia Code § 33.1-46.2. Designation of high-occupancy vehicle lanes; use of such lanes; penalties. However, this bill only extended the easement up until 1 July 1997; the law was later amended by 1996 Senate Bill 274 and 1996 House Bill 585 to extend the easement to 1999 and by 1999 Senate Bill 1068 to 2004 and finally by 2003 House Bill 2316 to 1 July 2006. It was a brisk, autumn morning while on my way to work my 1995 Nissan Altima was totaled by a minivan at the American Legion Bridge. It was 2000 and the hot, new technology was the 2001 Toyota Prius and the 2001 Honda Insight: the first generation of hybrid cars. I needed a new car, and I wanted one badly! But the Prius was back-ordered for months and I needed to get to work; I couldn't wait. So I resigned myself to the most fuel-efficient car I could get in the full-sized class. I'm still driving that 2001 Toyota Avalon today. Around this time the Federal Government started to get involved in national guidelines for HOV designation and usage. On 10 August 2005, Public Law 109-59 was passed, adding Section 166: HOV Facilities to 23 United States Code, Chapter 1. This set at the Federal level the allowances already specified by the Commonwealth, which was charged with defining rules for its Clean Fuel easement by 30 September 2009. Yet while the U.S. Congress was providing an HOV easement for all, Virginia was beginning to clamp down. On 19 April 2006, the Virginia General Assembly passed House Bill 1248 and Senate Bill 454, which amended Virginia Code § 33.1-46.2 to define a second type of Clean Fuel plate. This new plate would begin issue on 1 July 2006 and entitle any vehicle which bore it an easement to travel on any HOV lane in the Commonwealth of Virginia except along the I95/I395 corridor. Where as any car registered before 1 July 2006 would continue to be given carte blanche access to all of Virginia's HOV lanes with single occupancy. With this new provision, the easement was extended another year where by both types of clean fuel plate would be allowed to use the HOV lanes outside of I95/I395 and the older plate allowed to continue using those lanes too. I was quite angry when this was announced. After all, I had wanted to get a hybrid, but they weren't available. I certainly wasn't going to trash a five-year-old car for a new one at that point. As an environmentally conscious individual, such waste would have been anathema to my nature. So instead I planned. I knew that my car should last another 5 years, and I knew the days of better technology were coming. This was the seeds of the website you see here: if I couldn't have a car with clean enough fuel for all HOV, I'd get an even cleaner fueled vehicle for my next automobile! I'd get an electric car. This system of two-tiered Clean Fuel categories was extended to 1 July 2008 by 2007 House Bill 2132, to 1 July 2009 by 2008 House Bill 1014, to 1 July 2010 by 2009 House Bill 2476 and finally to 1 July 2011 by 2010 House Bill 214 on 11 March 2010 and by Senate Bill 552 on 10 April. On 20 April 2010, I placed a $99 reservation on a Nissan LEAF. Finally I was going to get my Electric Car! We were told that the Southeastern United States would be allowed to order the car in December 2010, and assuming 6 months of production, we'd have our cars by June, 2011. I might not be able to drive HOV single occupancy on I95/I395, but at least there would be I66 and VA 267, the Dulles Toll Road and Greenway. On 10 December 2010, my dreams of driving electric were dealt a serious blow. The night before the delivery of the first production Nissan LEAF, they informed all reservation holders in the Tier 2 market, which at that time consisted of the 7 states of Alabama, Florida, Georgia, Maryland, North Carolina, South Carolina and Virginia, as well as the District of Columbia, wouldn't be able to order their car until Late Summer 2011. Late Summer 2011 ordering meant late autumn delivery at best; well after the end of the HOV easement 1 July 2011. Why would I worry about that when the General Assembly had been steadily renewing the easement each year? It comes down the second part of 2010 Senate Bill 552. Just like 2006 House Bill 1248 and 2006 Senate Bill 454, the 2010 bill defined a third class of Clean Fuel plates with a further restriction: no more access to I66 HOV as single occupancy after 1 July 2011. By delaying the car release in Virginia by 8 months, Nissan was injuring its customers not only by the delay itself but by the fact that no LEAF bought in Virginia would qualify to drive on the HOV lanes of either I95/I395 or I66 with single occupancy. The 2011 Chevrolet Volt, with it's late 2010 release, would qualify, as well as any Smart ED leased here in addition to the Commonwealth's 2 or so Tesla Roadsters. None of those cars were released before 2006 and thus none qualify for the original Clean Fuel badge, but at least the handful that got in before the deadline get to use I66 single occupancy — but not the LEAF, not the Ford Focus Electric, not the Tesla Model S. Clean cars can drive, but Cleaner cars are left sitting in traffic. On 28 March 2011, Virginia House Bill 1432 extended the HOV easement until 1 July 2012. Yippie! I can use HOV single occupancy if and only if I pay a toll. And the badge in the middle: how can I spell anything with that? It's ugly! California knows how to treat environmentalists right. Effective 1 July 2011, while the Commonwealth of Virginia was taking away HOV rights from the first generation of Electric Vehicles, California started restricting its HOV single occupancy to only cars with a White sticker, meaning Super Ultra-Low Emission Vehicles (SULEV), Inherently Low Emission Vehicles (ILEV) and certain Ultra-Low Emission Vehicles (ULEV). The LEAF qualifies for this, but hybrid gasoline vehicles don't. Not even the Chevy Volt qualifies in California. Effectively, you need to be nearly Zero-Emission to get the White Sticker. The White Sticker easement extends until 1 July 2015. Yellow stickers for Hybrids and Advanced Technology Partial Zero-Emission Vehicles (AT PZEV). They were limited the first 85,000 applicants and expired as of 1 July 2011. California is also considering a new Green Sticker to begin distribution on 1 January 2012 and restricted to the first 40,000 applicants. It's unclear whether the LEAF would qualify for a green sticker, but according to the list of qualified vehicles, the 2010 Plug-In Prius does. More information can be found in the California Clean Vehicle Incentives FAQ. In Maryland, Virginia's neighbor to the North, they also have an HOV easement, but they restrict it to plug-in vehicles only. This means the Chevy Volt and the Nissan LEAF qualify. I like the Volt so I like this system. I prefer Zero-Emission as the standard, like California, but the advantage of following Maryland's lead is that we could co-operate on the issuing of stickers and recognize them in both states. Thus Marylander could use Virginian HOV lanes and Virginians could use Marylander HOV. I also like the sticker approach because it ties the qualification to the vehicle and doesn't allow it to convey the benefit in perpetuity like you can with the original Clean Fuel plate in Virginia. I don't mind people who were early adopters having an advantage for HOV usage, but it's time for a new generation of early adapters. It's time for the Electric Vehicle. Now you know the background, here is what I'm planning to say tonight. In 2000, when I bought my last car, it was next to impossible to get a hybrid. Hybrid vehicles were, after all, limited to a handful of custom imports and hobbyist vehicles. There were barely any of these new, clean cars on the roads of the Commonwealth back then. Hybrids were, after all, expensive, untested domestically and weren't even available in major dealer showrooms yet. At that time Virginia Code § 33.1-46.2 Section A Paragraph 6, allowing single occupancy HOV usage to cars baring Clean Fuel plates, made a lot of sense. There weren't very many hybrids on the road so letting them use the HOV lanes wouldn't affect traffic congestion greatly. However, as of mid 2011, we now have over two million hybrid vehicles on the road, and many of those are right here in Northern Virginia and around Washington, which boasted the fifth largest growth nationally in the hybrid market. The Commonwealth has adapted to this, limiting single occupancy access to certain HOV areas, but this favors the oldest hybrids and doesn't encourage our citizens to help our business by buying new cars. Today, hybrid vehicles are ubiquitous. Plug-in and Battery Electric cars, however, are still rare. These newer, cleaner vehicles are today where hybrid vehicles were back in 2000 and 2001: expensive, untested domestically and not even available in major dealer showrooms yet. Just as the Commonwealth helped the nascent hybrid vehicle market to grow though the HOV easement, so too, I argue, that the next generation of even cleaner fueled vehicles should have that privileged. It's time we cleaned up our clean fuel cars. It's time to put zero-emission vehicles on I66 and I95/I395. It's time for those busy and congested roads to produce no pollution for the housing that runs along these highways, where families live and children play. Don't we want to stop our voracious appetite for hydrocarbons coming from nations which dislike us? Isn't that the kind of kind of Virginia we should be striving for? That part of the speech should run about 2½ – 3 minutes, which would be my allotted time; I'll therefore submit the rest of the speech as follows in written comments. Keep things as they are, with new, zero-emission vehicles restricted to VA 267 and no access to I95/I395, nor to I66. End the Clean Fuel HOV easement all together, which although fair would, I suspect, make no-one happy. Evolve the requirements for the HOV easement over time, expiring dirtier cars and creating openings for cleaner ones. We might not be able to tie this to specific CAFE standards according to the EPA, but at least we could work towards emission targets. Simply put a time limit on the HOV easement, so that the oldest cars only qualify for say 10 years and as those cars expire, new slots open up for the new generation of cleaner vehicles. Allow only Plug-In Vehicles, vehicles that can be plugged into the wall, to take advantage of the HOV easement. As a resident of Northern Virginia I find this the best solution for the Commonwealth because it's the exact same rule which governs our neighbor Maryland. In fact, what would benefit the residents of Northern Virginia most would be if Richmond and Annapolis could set up a joint commission and co-operate on the issuing of this Plug-In easement such that each state would recognize the other's right to use HOV single occupancy within both states. And finally, if we're to enact any but the first two options, I would recommend that we end the use of the Clean Fuel plate in favor of a non-transferable sticker, like California and Maryland. The ties the easement to the qualifying car and allows the Commonwealth to restrict usage to specific vehicles rather than to an owner, since it's the car we need to be clean. I know I'm not making any friends with this viewpoint but in the long run, I see any of options three through six as in the best interest of the Commonwealth. Let's keep Virginia green and I thank you for your time! I know this speech will rub a lot of people the wrong way, but it's from the heart and I feel it must be said. Will you join me tonight? Labels: California, Chevy Volt, Clean Fuel, Ford Focus EV, HOV, Maryland, Nissan Leaf, Open Letter, Smart EV, Tesla Model S, Tesla Roadster, Toyota Prius, Virginia, Washington D.C.
After months and days of complex posts and decisions, I finally put in a work order for the two meter solution. I called Dominion this morning trying to get more information on the meter base that my electrician Joe from Cullen Electric will need to install. After many attempts to retrieve that last piece of the puzzle, we determined that the work order for the meter has to be submitted first before Joe and I can get the correct meter mounting. With the work order, a Dominion engineer will examine the premises and hopefully work with Joe to get the meter installed properly. I trust Joe and just need to find out when would be the latest he could come before the meter itself was installed. Otherwise, it's pretty much a done deal! I decided to go with Schedule EV because I really don't trust my calculations for what my household electrical usage is. I worked out the estimates for my hourly usage 8 months ago and wanted to post this chart at that time, hoping for reader's feedback. But now I'm up against the decision time; I just couldn't wait any longer. The simple, one-meter, no new holes, no complex electrical work solution just wasn't enough to put me in that camp, even though I was leaning that way when I first contacted Dominion. Instead, I get to live as I have been living under Schedule 1, and yet charge my EV, and my EV alone, under Schedule EV. It's a more complicated solution, but it'll make the charges easier to isolate and I can get a decent picture of how much electricity my car is actually consuming. That is, assuming I don't also charge at work. The one major danger is the gap between Joe bringing out the circuit to the meter mounting and when the meter is installed and the circuit goes live. During that period, I'll not have any access Level 2 charging, and with my long commute, it looks like I'll have to be driving my ICE (Internal Combustion Engine) again. Sigh. During the Canadian Thanksgiving Day weekend I called Dominion's Electric Vehicle information and sign up line to discuss which pilot project I should choose: Schedule EV or Schedule 1EV, below. I found out that if I signed up then I'd be getting my new meter before my EV arrived which wouldn't be useful for the program. We thus decided to punt the decision until after my next meter reading on the 17th of October. That way, the new meter would be installed during the subsequent meter reading in November, which should be after my LEAF arrives. The other thing I found out was that the Smart Meters Dominion installs are an earlier design. These units are only capable of sampling electrical usage at fixed intervals which allow them to calculate for each of the prescribed Time-Of-Use intervals under the given rate plan. They don't have the advanced technology of having 3 lines to the house, where, for instance, one has a household line, an EV line and potentially a line to a Solar or Wind generator. In fact, the Schedule EV program installs 2 meters on your home. You keep your original meter for your household, ticking off net electrical usage under the standard Residential Schedule 1 rate. Typically next to this, they add a second meter to the mains which is the smart meter monitoring the EV usage under Schedule EV. However, if they find it convenient, they may place the meter anywhere where an electrical line in can be tapped, though the location of the current meter seems the most logical. The other new Smart Meter technology is the ability to create a mesh network, as they're doing in Austin, TX. This technology allows the customer to monitor their current and historical electrical usage via a wireless network that sends information to Austin Energy. What's more, these new Smart Meters can communicate with smart household appliances to regulate appliances like a refrigerator or central air conditioning, allowing the power company to reduce household electrical usage during peak hours. On the surface this may sound like big business controlling we the consumers, but it benefits us too. After all, throttling our appliances during the most expensive, peak demand will save us money, especially if we're under a Time-Of-Use rate. As stated above, folks interested in the Schedule EV plan will be getting a second meter to monitor the EV electrical usage. Because this is a second meter, it needs to have its own line into the house which must be provided by an accredited electrical contractor. Dominion's responsibility is only to the meter. They'll hook up the meter if and only if there's already a line into the house with a empty mounting for a that meter, as would be for Schedule 1EV (household Time-Of-Use). If your electrician hasn't yet run the line out for the second meter and installed the meter mounting, Dominion can't connect the meter to your EV. So today I spoke with my favorite Electrical Contractor, Joe from Cullen Electric, Inc.. Unfortunately, for most of the conversation I had him confused with a representative from Dominion, much to my chagrin. I'm waiting for a call from the Net Metering folks at Dominion to answer a question I still have about hooking up solar panels under one of the EV schedules. So unfortunately I dragged Joe into a long and only partially productive debate about installing Photovoltaic panels on my home. My plan is still to consider installing Solar Panels on my home, especially if I can get the guidelines of my HOA overturned this week, but obviously that's not why I asked Joe to call me. Sorry about that Joe! Anyway, Joe estimates the job to be about three-quarters of a day's work and estimates about $700 – $800. Basically, since there's already a circuit breaker panel in the garage for the EV, Joe just needs to pull the 125A 1/0 SER cable out of the main breaker, hook it into a new cut-off switch and then run a wire out from the cutoff to the new meter mounting. The cutoff switch is for safety since it needs to be within a minimum number of feet from the meter, but is convenient since it doesn't require the current 125A wire to be extended. As of the time of this writing, I'm still checking with Joe on whether he knows which meter mounting to get but if I do go with Schedule EV, it looks like he can install it pretty close to the Smart Meter installation date, assuming it's 17 November as Dominion indicated to me when I first called. This by far is the most complicated rate of all that I've analysed. Not only is it a Time-Of-Use rate, like Schedule EV, Schedule 1T (The old Time-Of-Use household rate) and Schedule 1S (The Time-Of-Use rate used for houses with Solar Net-Metering), but its seasonal periods break mid-month so it means I have to compute complete months then prorated, partial months in during the summer schedule and add that to prorated, partial months in the winter schedule. Thus, my sheet does 3 look-ups for each month and each hour, making it bulky, slow, hard to maintain and from which it's hard to get specific details. What's more, Schedule 1EV is an alternate rate, not an additional rate. You use Schedule 1EV instead of Schedule 1, not in additional to it like with Schedule EV. This means that your entire household rate could be effected by the change, not just by the addition of the EV, but now your usage and time of usage matters for everything. When you run your A/C or Electric Heater, when your Refrigerator cycles or when you watch Television or Browse the Internet can all effect your total electricity rate. 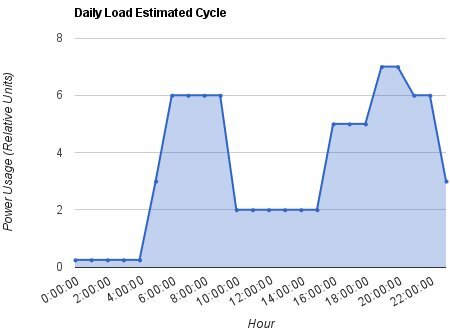 Since my home is currently on the 2-tiered, fixed-rate Schedule 1 plan, I don't have any information about how many kWh of electricity I use at say 10 am (hour 10) or 10 pm (hour 22), or when I may be my peak usage and when do I use the least. The EV is easy to estimate because I know when I plan to charge it, how long it takes to charge and thus when the charging will typically stop, not so with the whole household. All I know for sure is the total electricity usage in my one month billing cycle. Any more detail than that, and I have to guess. I've literally wanted to post this since I wrote the first part of this article back in February. Indeed, it's the entire inspiration for this series I've made about explaining the electric rate. Of all the things I've discussed thus far, I can show evidence, trace steps, and point to solid sources of information to back up my claims. When it comes to estimating household electrical usage, however, things reduce to an educated guess. To start with, I decided to assign an arbitrary point system to my daily electrical usage. The points don't correspond to any real-life value, they just follow the rule that if hour x value is greater than that for hour y , then that hour is estimated to use more electricity and if the value at x is twice y then x used twice as much electricity as y , The following table details the numbers I used and some of my reasoning. Phew! So, that's what I estimated. I took those numbers, summed them to get a total points used, then divided each by that number to get a percent usage, which you can see next to the raw values above. I take these percents and multiply the total monthly usage by them to get the estimated total monthly electrical usage for that hour of the day. Because I've never been on a Time-Of-Use rate before and I'm no-where near confident with these numbers, I would be happy to hear from one of my readers to show my my mistakes. Barring that, I could just go with the Schedule 1EV rate and see what happens. They won't break out my usage in hours for me, as I explained above, but I could at least see if my estimates were near the mark. Rate to Rate: Who's cheaper for a household? Up until now, I've only been talking about EV rates. The amount of money it costs to run the household electricity is different than that for an EV because the costs for an EV already assume some electricity usage so the electricity is never metered from zero. For instance, under Schedule 1, there are 2 tiers of electrical usage for the base Distribution and Supply rates: the first 800 kWh are charged charged at one rate and anything above that at another. As such, since my home already uses more than 800 kWh per month, my EV would always be charged the abouve 800 kWh rate. In addition to this, there are taxes like the State Consumption Tax, the Special Regulatory Tax and the Local Consumption Tax, as well as the Fairfax County tax. In the case of the three Commonwealth taxes, they are each 3-tired taxes. In Part 2 I estimated that most of my EV's electricity would be in the in the first Tier, with a little less than &frac13; in Tier 2. With the household, we're counting from zero so all again most usage is at Tier 1 with a bit in Tier 2 with the above 2,500 kWh usages over Summer. Also, where as the Fairfax County Tax has already reached its $4 cap by the time we start to count the EV, that entire $4 is paid at the household level. As before, we need to explain the base rate calculation here. I currently estimate about 21,441 kWh per year of electrical usage in my household given the pattern of data I have going back almost two years. How this breaks down in terms of the Consumption Taxes is 20,051½ kWh of that is under the Tier 1 level and only 1,389½ kWh falls under Tier 2. I again use these estimates to calculate the last 0.151¢ of the tax total. I've also eliminated the County Tax from the calculation but not because it isn't paid, but because it's always always $4.00 per month for me, regardless of how much electricity I use. For this rate to be relevant, I'd have to use less than 661.157 025 kWh of electricity in a given month and that is no-where near happening. After all, I'm never even going below 800 kWh to stay within the Schedule 1 Tier 1 Base rate. Thus, the County Tax and Monthly Distribution rate are not counted in the total cost per kWh, but are included in the annual totals. In summary, I spend about $1,081.92 each year in electricity regardless of rate schedule on all the secondary items, riders and taxes. This value is without the Base Rate, which turns out to be the lion's share of the calculation. As I stated before, Schedule 1 is a 2-Tiered system. It's also a seasonal schedule, with different rates depending on the time of year. These rates are summarized in the following table. The Subtotal in the table above contains the sum of the Distribution and Supply costs and the Total adds this to the cost for everything else, including Taxes, Fuel, Transportation and the various other Riders. The main take-away here is that if my estimates are correct, there's not much difference for the household electricity cost under Schedule 1 and Schedule 1EV; my calculations show less than $10 per year! Stranger though is that the Distribution is about $70 higher under Schedule 1EV but about $60 lower than Schedule 1 for Supply. Secondly, as you can see, the cost to run an EV under Schedule EV and Schedule 1EV doesn't differ much either. Schedule 1EV looks to be about $25 cheaper than Schedule EV, but both are clearly less than half the rate under just Schedule 1. What if the LEAF had a 6.6 kW charger? I would be remiss if I didn't do the same analysis for the Schedule 1EV that I did for Schedule EV with respect to 6.6 kW charging. Specifically, the $98.68 I pay per year for charging my LEAF from hour 22 to hour 1 (Off-Peak) could be reduced to a mere $0.22 cents and my Super-Off-Peak per year goes from $42.46 to $65.38 per year because of the greater overall electricity usage. 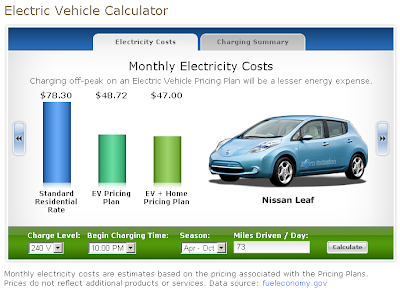 Thus, the cost to run the LEAF under Schedule 1EV goes down to $384.78 per year, about $75 in savings per year. And that's all you need to know when you choose a new EV rate schedule. So call Dominion right now: 1-866-566-6436 and join the EV Rate Revolution! 1Doesn't include the Monthly Charge since this is already assumed in the fixed cost independent of the rate program. During the International DeLorean Owners Event in Houston, Texas last week, DeLorean Motor Company announced a partnership with [an] electric car company called Epic EV. The goal is to mass-produce a full electric DeLorean called DMCEV. The news is coming from Jalopnik.com. So far, said Espey, the company has retrofitted one car with an electric motor. If all goes well, he said, the company would start selling built-to-order electric DeLoreans around 2013. The sticker price (if a custom-built car can have a sticker): about $90,000. Still no news of a fully-electric Time and Relative Dimension In Space vehicle, though we do know the Type 40 ran on Artron Energy derived from the Eye of Harmony at the heart of the Gallifreyan Panopticon. However, I can confirm that the Kronosphere does run on electricity, even though it won't be invented until 2020. All joking aside, this is seriously making me rethink my investment into the Nissan LEAF, if only the price wasn't so out of reach. That's how much we Americans would be paying as a whole if the Federal Government charged 1¢⁄kWh in taxes for every kWh used for all of the Residential, Commercial, Industrial and Transportation levels. This is based on the total electricity usage of each sector over the 12 month period from July 2010 to June 2010, which is summarized below. Now, in places like Wyoming, with the lowest overall electricity rates in the country in 2010, and especially in the Industrial sector with a 4.79¢⁄kWh average, this tax would represent a 20% increase in the rate of electricity, but in places like Hawaii, with the highest overall electricity rates in the country, and with Residential rates averaging 28.1¢⁄kWh, this represents a mere 3½%. Currently there are no federal taxes at least on residential electricity usage. So if the 1¢⁄kWh tax was enacted, it would be the first ever tax on electrical usage at the national level. And after all, $37.6 Billion is just a drop in the bucket in terms of federal spending. None the less, it's money that could be used to pay for much-needed infrastructure improvements and given the balanced-budget oriented Congress, this would at least allow for the payment of some infrastructure projects which could include investments in solar, wind and geothermal power. The main problem I see with this across-the-board tax is that like all flat taxes, it's in some ways regressive. Where as the rich can afford to conserve and reduce electricity usage, lower-income folks won't be able to afford such modifications and so will end up requiring more and paying more for the same amount of service. I therefore don't support such a tax as is but think this is a debate that we as a nation should have. Much or the U.S. infrastructure, including even the electrical grid itself, is aging and passed it's original life expectancy. We need to invest in the next 20, 30 and 50 years to keep America equipped to maintain its commercial edge. Source: the U.S. Energy Information Administration's Sales Revenue Spreadsheet (xsl). Back in 1997 or so I longed to use a different kind of vehicle. Those who know me probably could never guess I had this kind of adventurous spirit or that I long so much for those days of old but yes, back then I attempted to get my Pilot's License on a Cessna 152. Now, to cut a potentially long story short, I never finished my VFR (Visual Flight Rules) training nor took the written exam, though I did complete the ground course over at Freeway Airport in Bowie, MD — a bit of a long hall these days. But in late 1997, for reasons I can't for the life of me remember, I stopped. Strangely enough, this was soon after I put down a $500 deposit on a block account that still has about $250 or so on it. Not that I expect their records go back 10 years such that I could reclaim it; it's my own fault for stopping. In 1999 my Class 3 Medical Certificate and Student Pilot's Licence expired and since then not only have I been too lazy to drive out to Freeway but I've even been to lazy to renew the license. Now recently I've been very focused on Electric Vehicles, in case you hadn't heard. And although this site is Affordable Electric Car NOW! , for an aspiring pilot like me, it doesn't stop there (and don't get my started on my plan for the Affordable Self-Driving Electric Car NOW! page I'm planning to start in about 8 years). I still dream of flying around the country, from city to city in a plane of my very own, and how more appropriate could that be if I did it electrically? I truly believe it'll one day be possible to fly a full-sized airplane using only Electricity — and I'm not the only one. For instance, Cessna with Beyond Aviation are attempting to do just that: Electric Cessna 172 Begins Taxi Tests. It'll be a number of years before an Electric Cessna is commercially available, to be sure, but I've got time; I'm already 10+ years invested in patience! But to be honest, I'd love a hands-on hobby, so I'm making it a goal of mine, over the next 10 years, to either purchase or (more likely) retrofit a Cessna 172 for electric propulsion. Of course, let's not jump the gun. First I need to finish my VFR and IFR (Instrument Flight Rules) coursework and pass the flying tests — and before even that renew my Class 3 Student Pilot's licence, and I'd better do that before I turn 40! Only then would I look into purchasing a second-hand Cessna and start the detailed and intricate research into replacing the Internal Combustion Engine with an electric motor and the fuel tanks in the wings with light-weight and efficient, advanced Lithium or newer technology batteries.